No. 2, Jalan Silat Gayong 15, Bandar Selesa Jaya,81300 Johor Bahru, Johor, Malaysia. Division, Scarffolding Division and the Hardware Division. 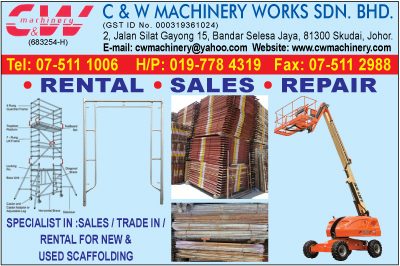 Our Scaffolding Division provide services such as rental, by back, erection and dismantling on top of sales for scaffolds and accessories. Our scaffolds conform to BS 1139 British standard, and options for the cup lock system, ring lock system ot tabular scafolding system are available. Finally, the Hardware Division offers products such as Plastic Wheels, Concrete Spacers, Mortar and Plastering Additives, Bar Chair etc. 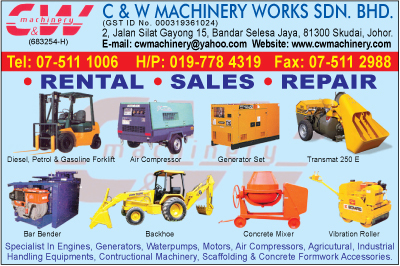 We operate in 3 shop buildings that are adjacent to each to each other at our site in Skudai, Johor. Our company consists of 13 dedicated members who offer friendly and quality services.